On January 12, 2014, Pope Francis blessed 32 babies with the rite of baptism in the magnificently beautiful Sistine Chapel. Even in this, the most sacred building in Christianity, the new pope’s down-to-earth approach to life and religion were evident as he spoke with the babies and their parents, even going so far as to encourage the mothers to breastfeed on the spot if a baby is hungry. It was the new Pope’s first annual baptism service. His improvised homily contained only 300 words of comfort, not at all the long-winded well-rehearsed theological homilies delivered by his predecessors. It’s the first baptism ceremony to bless the child of a couple married in a civil ceremony rather than a formal Catholic Church wedding ceremony. And it was the first time the act of breastfeeding in the Sistine Chapel got a formal papal blessing. Pope Francis welcomed the families in a relaxed manner and suggested they not feel intimidated by the treasure-laden chapel. This directive in the Sistine Chapel strengthens his statement in an interview last month in which he said no woman should feel uncomfortable breastfeeding during one of his ceremonies. The ritual of baptism formally initiates a person, including an infant or child, into Church membership. The ritual, as it’s conducted at the Sistine Chapel, involves pouring holy water onto the foreheads of the babies. Traditionally the sacrament of baptism is restricted to children born of marriages conducted in strict accordance with Catholic law, which means marriage in a church by an ordained priest. Since his papacy began in March 2013, Pope Francis has remarked repeatedly that the Church should not shun children born of irregular situations so they are made to feel inferior in the eyes of the Church. To demonstrate his belief in this sentiment, he baptized Giulia Scardia, the 7-month-old daughter of parents married in a town-hall civil service. Such a marriage would not traditionally be recognized by the Church. Baby Giulia’s mother, Nicoletta, told a local newspaper that she got married quickly, with no time to organize a more formal, Church-sanctified wedding. She’s not ruling out the possibility that that might happen some day, though. Source: Pullella, Phillip. 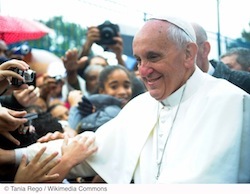 “Breastfeed babies if you want, pope tells mothers in Sistine Chapel.” Yahoo! News. Reuters. Jan 12, 2014. Web. Jan 23, 2014.